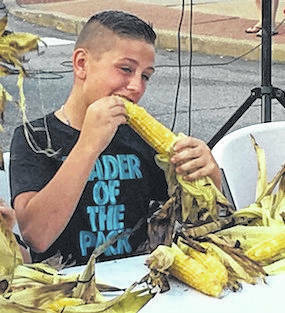 Young and old alike enjoy sweet corn during last year’s festival in downtown Mount Gilead. A total of 208 dozen ears were consumed. MOUNT GILEAD — Shelley Planey’s voice gives away her excitement. “I love the festival. It’s the chamber’s give-back to the community,” Planey said as she met with the committee to put “fine details” on the 12th annual Sweet Corn Festival held downtown July 20-21. Planey, Morrow County Chamber of Commerce & Visitor’s Bureau executive director, wants more emphasis on the KidZone and families. “Street fairs have something for everyone. We want to focus on Morrow County families. Let them come and enjoy dinner and music in a safe, family-friendly environment,” she said. There will be plenty of musical entertainment both days, with four bands on Saturday. Games, bounce houses and a free kids movie, “Little Mermaid,” at the Capitol Theatre at 11 a.m. Saturday. Touch-A-Truck and other activities for youngsters are planned. Volunteers are the backbone of the festival, Planey said. As an example, the four county libraries will provide manpower for the KidZone. A portion of the proceeds will go toward Hospice of Morrow County. Fresh roasted sweet corn — 208 dozen were eaten last year — will be sold. Other food vendors and a beer garden will on site. If you want to work off those calories, there is a 5K run/walk and a 10K run starting at the former Save-A-Lot parking lot, 100 W. High St., at 9 a.m. Saturday. Sponsors are critical as well, Planey noted. “They are the ones giving this festival to you. We supply the muscle and they support us. I believe that hands that give are hands that receive,” she said. The festival began in 2007 after the popular gourd show ended, said former Chamber Director Rosemary Levings. “After it left we didn’t have anything here in the summer. Our board met and one of our members suggested a sweet corn festival,” Levings said. Levings said she’s pleased with the growth of the festival, notably more events for children. “The car show was added around 2010 when I retired, and the event has grown,” she said. 8-10 p.m. — The Jake Binegar Band. Country recording artist Jake Binegar was featured at the 2017 Morrow County Fair. Recently released new album, Just Hangin On. Fully sponsored by Century 21 Gold Standard. Four bands from the stage in the free concert series. Bring your own chair. 11 a.m.-1 p.m. — Parental Guidance. Classic Rock hits played from local performers. 2-4 p.m. — The Digs. Bart Jenkins, who played last year at the SCF with Third Degree Sideburn, and his rumble bass is back with his new band playing swing and classic R&B. 5-7 p.m. — Erica Blinn. Native to central Ohio but straight out of Nashville, this country recording artist packs a smoldering country rock sound and recently rolled out her new album, Better Than Gold. 8-11 p.m. — Southern Ground. Morrow County’s own and frequently found playing at Boondocks, they play high energy contemporary country with southern rock roots.